A busy weekend is ahead of Taupo with the ironman only days away and plenty of internationals flooding in each day to prep for their big day. I have been hard in training and think I am ready and in a good space watching from the cafÃ©!! Fishing continues to be pretty good with the backcountry in where I have been fishing extremely well. I fished fairly locally yesterday and think I may have had the best day I have ever had on the dry fly with close to 40 fish hitting a small Cicada pattern. Conditions remain low and there is still plenty of heat in the day which in my experienceÂ is perfect when heading into the hills. I have quite a few new tracks on this river and so far they have not been seen or found by many and no footprints have been seen so fishing has always been good, this should stay this way to next year as pressure on thee locations will start to drop off. Local rivers seem to be seeing the first of the new season trout, early spawners maybe?? The WaytoohardanuiÂ I hear has some rainbows in it along with the browns which are usually hanging about over summer. Last time I was in this river it was only half the river it should be andÂ is suffering from lack of water so Id expect thee to be hard to catch and spooky, hope they get top the spawning grounds. The Hine has some fish in the lower river hanging between the firstÂ and second car park, they are pretty flighty but its nice to see some fish of size again in this water. The last couple of seasons on here has been very good so we will wait and see if this winter continues. Still some solid browns remain in the lower section of the river but I cant catch them, they are alive but finding one to eat your flyÂ seems near impossible. 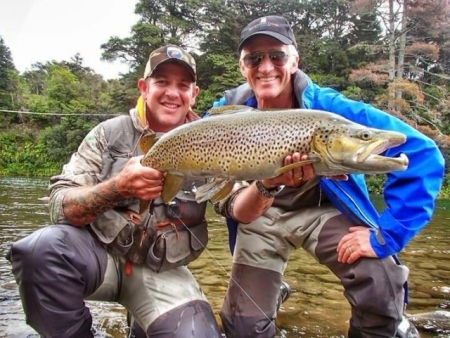 The Tongariro remains my pick of local rivers and will fish well into winter. I have again been mooching about the brown trout spots and somehow managed to score another impressive fish with a client from the USA. This fish had stunning colours and awesome figure of a fat trout weighing in at 11 pounds. The fish was caught from the same pool as the 14 pound trout caught the week before , quite unreal actually. This fish will count its lucky stars and was released for another person to enjoy, hopefully he will make it back to the lake and come back next season even bigger! !Its beenÂ a good summer season.